Scottrade free stock dividend reinvestment plan summary: Scottrade is one of the best discount stock brokers out there with low trading fee, commission-free ETFs, comprehensive research tools, and excellent customer service. However, it currently doesn't offer free dividend reinvestment. That could change as early as the fall of 2012 as the brokerage firm is planning to provide automatic free dividend investment. The answer to that question can be Yes or No, depending on what kind of investments you are talking about. If you are asking about mutual funds (Scottrade is also mutual fund supermarket with thousands of mutual funds), then Yes, Scottrade does allow dividend reinvestment for mutual funds and the process is automatic. All you need to do is indicate at the time when you purchase shares of a mutual fund that you want the fund’s dividend distribution reinvested instead of taking the distribution as cash. If you want to buy mutual fund shares regularly, through their systematic purchase plan, you can set up dividend automatic reinvestment as well. If, on the other hand, the question is about stock dividend reinvestment, then the answer is No, you can reinvest stock dividends with Scottrade. As a popular online discount broker, Scottrade belongs to a smaller camp that doesn’t offer stock dividend reinvestment. The reason for why stock dividend reinvestment is not allowed isn’t very clear because there doesn’t seem to be any technical difficulty for offering that as many discount brokers, especially those newer ones, do have dividend reinvestment service. 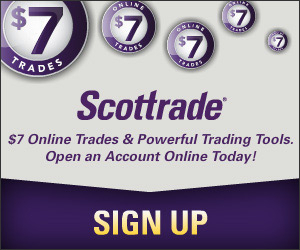 If you buy dividend paying stocks with Scottrade, then all the dividends will be distributed as cash. If you want to invest the dividend, you will have to purchase shares with the distribution separately, meaning that you will pay $7 commission for each transaction, the same as you purchase shares with your own money. If you want to buy dividend paying stocks and have the dividend distribution reinvested, then you may want to look other discount brokers such as TradeKing and Options House. Both of them offer free dividend reinvestments for both stocks and mutual funds. Make a deposit of at least $500 is required and receive 3 free trades. Thanks for the tip! I’m still completely new to investing (in fact, still doing initial research, haven’t bought a thing yet), and was wondering how DRIPs were at all feasible given high trading fees… I wasn’t aware some brokers offered it for free. Maybe DRIPs used to be expensive in the past, but definitely not now since more and more discount brokers are offering them for free. I like Scottrade and I don’t know why it doesn’t have the service. Scottrade is otherwise a good company. I am also disappointed that they do not allow auto-reinvestment, so I would urge you to contact them and voice your desire that they change their policy. I had contacted Scottrade couple of months back about automatic dividend reinvestment at least for ETF (if not all the stocks). Customer services told me that they are working on it & plan to offer it soon. Hope they start to offer it soon. From what I heard, it could be available as soon as fall 2012. Let’s hope the service will be available soon. I can’t wait. A couple months ago I spoke with a ScottTrade rep about Drip’s he said they would roll out the program in early 2013. I called again last week and was told it would be April or May 2013. It seems like they keep extending it. I hope they do it soon.